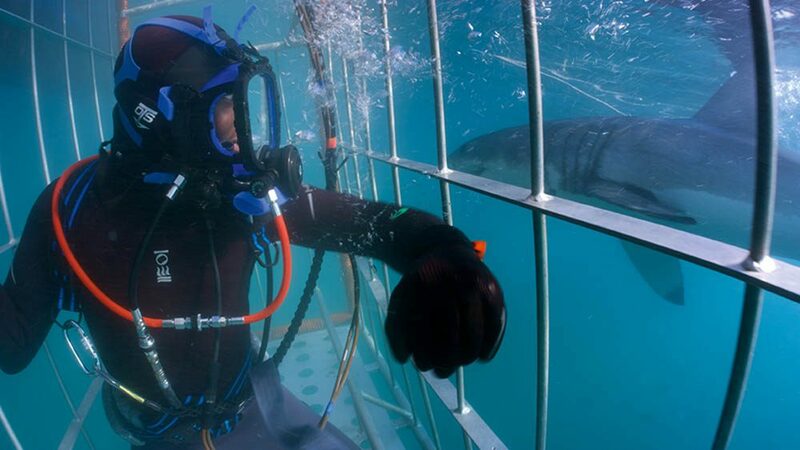 In the cage for the great white shark experience, using a wetsuit after the drysuit debacle. ON ONE OF THE LAST DAYS of filming off Dominica in the Caribbean, Patrick Aryee found himself swimming alongside a sperm whale the length of a bus. “Because of where the cameraman was, I had to fin slightly further ahead of her,” he says. “I had to put some power in and I started to overtake her. “She then started going even faster, and I thought what, come on, and I slowed down. Then she slowed down too, and I thought, this is kind of cool. “I remember thinking I’m a human being, she’s a whale and I can feel the consciousness between us. Our eyes were maybe 2m apart, and in the water that feels very close. BRISTOL IS THE CITY so many of the UK’s wildlife programme-makers call home. It’s the base for the BBC’s Natural History Unit, the maker of all those great documentaries from Life on Earth to Blue Planet 2, and it’s where TV biologists and zoologists and many divers congregate. Londoner Patrick Aryee rolled up in Bristol 14 years ago, though with no idea of being a TV presenter – he was studying cancer biology at the university. By the time he was on to his Masters degree he was making ends meet by working at the BBC as a researcher. 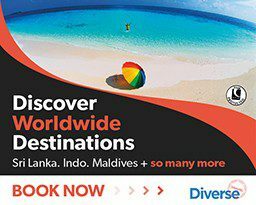 A producer who also happened to be an instructor at the university dive-club pointed out that BSAC was offering a discount on training, and he enrolled. 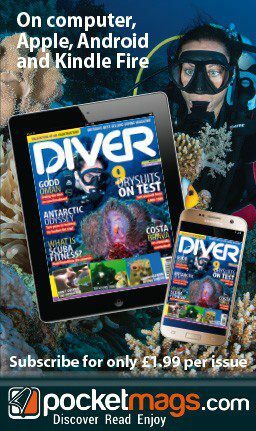 “My first open-water dive was in Brixham, dressed in 7mil neoprene, and I’m thinking I know this was something I’d always wanted to do, but what am I doing in this ice-cold water? As it turned out, working life intruded, and apart from a few more dives in Cornwall and on a holiday in Malaysia Patrick had no time to pursue the sport. “I’d done the course so that I could go scuba-diving on holiday, but also in case opportunities arose at work,” he says. Trouble is, they didn’t. Patrick, who is now 32, continued working in TV wildlife film-making for the next 10 years. In 2010 some online episodes he had written and presented to accompany the David Attenborough series Madagascar caught the eye of the right producers, and he became a frontman. PATRICK’S COMBINATION of deep scientific knowledge and a light-hearted approach meant that his work was in demand, and over the years he has presented programmes about animals of all sorts for the BBC and, more recently, for Sky too. But apart from specials on archerfish and octopuses, these mostly seemed to be about animals living above the waterline. “Then one of my producers asked me: ‘If you could come up with a show, what would it be?’ And I said I’d love to make a show where I was swimming with killer whales. He said: ‘OK, swimming with big beasts kind of thing’. The result is Big Beasts: Last of the Giants, which airs on Sky in mid-June. It’s the sort of wildlife series that was never going to have a Blue Planet budget or ambitions, or years to spend waiting for the stars of the show to turn up. The crew arrived in Simonstown in South Africa for some cage-diving, and Patrick literally got off on the wrong foot. “I was in this drysuit ready to go, and I put one foot in and stopped. I said, guys, I think something’s wrong, it feels really cold and they’re like, stop wimping out. I said, look, my foot’s full of water. “Luckily I didn’t get all the way in. I lifted it out and there was a massive hole in the sole. It had been an ex-show suit and glued to a stand, and whoever took it off forgot to reseal it. So it got sent off to be repaired and I used a standard 7mil. 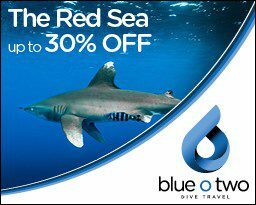 The next task was to snorkel with whale sharks, as well as manta rays, in Ningaloo, off Australia’s west coast. What he did realise was that he was wearing the wrong sort of fins. “The production team were like yeah, it’s totally fine, we know these are good fins.” The whale sharks did their bit by staying near the surface and moving in straight lines, “but when you’re presenting for TV you have to look graceful and streamlined. “You can be quite frantic in your movements, trying to get in position for the camera with your arms moving, and every movement looks a bit silly. I wanted my presence to mirror that of the animals. Patrick Aryee refines his freediving technique in the company of a sperm whale. The sum total of this training in December was four hours spent in a Berkshire swimming pool practising breath-holds. Still, hotshot instructor Emma Farrell of Go Freediving seems to have worked wonders in the limited time. “To go from my half-minute to 2min 45sec in a matter of half-an-hour or so was pretty cool,” says Patrick. “Emma gave me tips on breathing and finning – the one that was particularly handy was to get my feet right up when I dived, take a big swipe with my hands and just let the momentum push me down 5-10m quite quickly. “She also taught me the Frenzel technique – we’re so used to just using the air in our chest, as opposed to the small amount in the throat, to equalise. 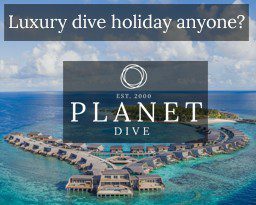 It’s quite tricky, especially later when I was doing repeated dives, up and down very quickly. I suppose, and I’ve noticed that most of my black friends don’t float either. 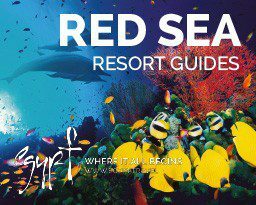 “Freediving as Emma explained it means being completely relaxed, floating calmly at the surface waiting to do your best. Full saturation, no stress. Then you go straight down until you’re comfortable at the depth you want to reach. 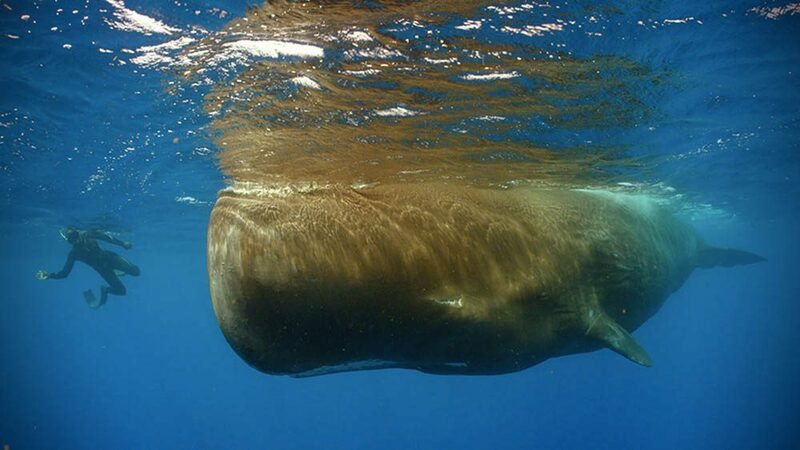 A week after his crash course, Patrick’s first open-water freediving experience was with sperm whales off Dominica. A local fixer nicknamed the Whale Whisperer would locate the whales’ calls on his boat’s hydrophone, and contact was made on four of the six days set aside. “First time I got into the water I could just see the bulbous head of the whale. I can’t lie, I had a slight fear of being in open ocean out of sight of the coast, and that feeling somewhere between excitement and panic, which I’ve since learnt to enjoy. “I’d be having to fin alongside the sperm whale and then, when she dived at an angle, I’d have to go down a bit and then also go at an angle, looking sideways. “That’s not ideal because you really just want to go as far down as you can and for as long as possible. The freediving camera-team stayed nearer the surface to provide a sense of the respective depths of whale and diver. “When we’d finished filming the rest of the crew jumped in. They came back and said, well, that was tiring, and I said I’ve been doing that for days for several hours at a time and yes, it is very tiring! “But after I’d come up for the last time I just had to keep myself away from everyone else. It took me a few days to get over the experience, actually. Before that I’d just been trying to make the show, worrying that we didn’t get the shots, asking if we had enough variety, did I look good? “Then I sat at home and just kept playing that clip and thinking wow, that’s the sort of stuff I’d watch, like the people I’d followed on Instagram. Patrick Aryee puts an underwater experience into words on the spot. 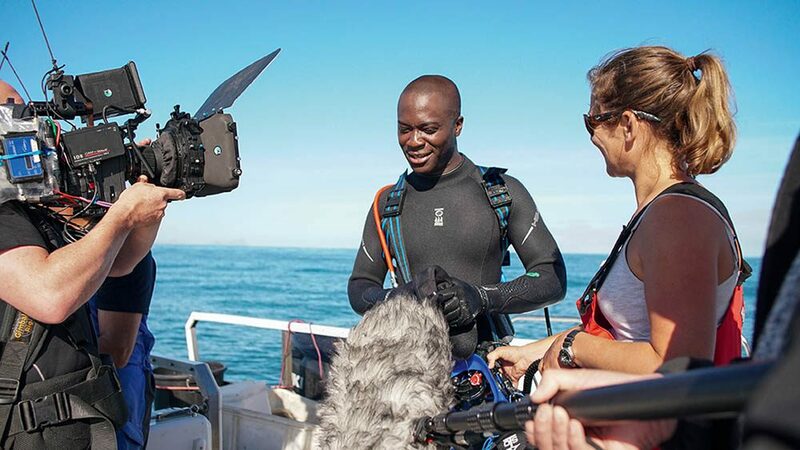 IF BIG BEASTS has shown that Patrick Aryee can cut it filming the underwater world, he also feels it marks the stage in his career where he can decide on the projects he wants to do, whether for Sky, the BBC or anyone else who shows an interest in his ideas.